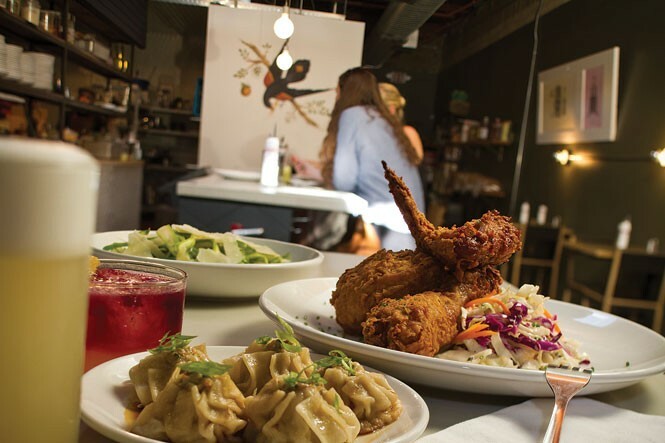 Utah saw the emergence of a number of exciting new restaurants in 2014, including Rye Diner & Drinks, Tosh's Ramen, Skewered Thai, the re-opened Finca, Harbor Seafood & Steak Co., Provisions, Kimi's Chop & Oyster House, From Scratch, Pho Thin, Copper Kitchen, Sole Mio, Handle and The Brass Tag, among many others. In 2014, Takashi turned 10, Log Haven turned 20 and Tres Hombres celebrated its 30th anniversary. I, meanwhile, managed to eat and drink my way through another year without winding up in the emergency room (knock on wood at press time). I'm often asked about my favorite restaurants. But the truth is, it's hard for a food writer/restaurant critic to have one. That's because most of the time when I dine out, I'm working, and it's not always the most enjoyable dining experience. I have to sample many dishes, but am not able to devour the ones I like most. And then, there's all the analysis and contemplation of food that can dampen the dining experience. Not that I'm complaining; it's a helluva lot better than working in a coal mine. It's just that I don't really get to eat at my favorite restaurants often, because I'm usually reviewing new and noteworthy ones. So, I tend to think more fondly about a certain entree here, an appetizer there, or maybe a creative cocktail that stuck with me for a while. My food memories tend to be of favorite dishes, rather than favorite restaurants. Here, then, are a few of the dishes, drinks and other foodie-type highlights of my 2014. One of the most memorable dishes I enjoyed in 2014 was also one of the simplest. It was Chef Tommy Nguyen's nothing-short-of-awesome shoyu fried chicken at Rye Diner & Drinks (239 S. 500 East, Salt Lake City, 801-364-4655, RyeSLC.com). I never thought I'd taste fried chicken as good as Thomas Keller's famous buttermilk fried chicken at Ad Hoc in Napa, but now I have. The other championship chicken I enjoyed was at Bodega (331 S. Main, 801-532-4452, Salt Lake City, Bodega331.com), where the honey-glazed beer-can chicken for two is tender, juicy and packed with flavor to the very last bite. Oh, and how could I forget the fried chicken claws at Dim Sum House (1158 S. State, Salt Lake City, 801-359-3838, DimSumHouseSLC.com)? Granted, these are an acquired taste. But once you've come to terms with eating chicken feet, you'll be jonesing for 'em as much as I do. My favorite sandwiches of 2014 can, as in the previous year, be found at Feldman's Deli (2005 E. 2700 South, Salt Lake City, 801-906-0369, FeldmansDeli.com). I find it hard to look past the bodacious corned-beef Reuben at Feldman's. However, with a bit of nudging from owners Michael and Janet, I finally ate a bit outside of my normal comfort zone and tried their unique sloppy Joe, which is about as untraditional a sloppy Joe as you could imagine. It's made with minced corned beef and pastrami, oozing with Thousand Island-soaked coleslaw, and served on Jewish rye. It's not traditional, but it's as unbeatable as it is messy. And Feldman's continues to make the best boil & bake bagels in town, to boot. On the subject of sandwiches, 2014 brought Even Stevens Sandwiches (414 E. 200 South, Salt Lake City, 385-355-9105, EvenStevens.com) to SLC. For every sandwich purchased, another is donated to folks in our community who don't have enough to eat, and I applaud the charitable work the folks at Even Stevens do to make a difference. At Cafe Gaudi (5244 S. Highland Drive, Salt Lake City, 801-273-0837, CafeMadrid.net), sandwiches have a Spanish flair. With its Barcelona-inspired breakfast and lunch, Cafe Gaudi offers Spanish bocadillos—traditional Spanish bocatas (sandwiches) such as serrano ham with manchego cheese or chorizo de Pamplona on artisan baguettes. Delicioso! As I'm always on pizza patrol, I was thrilled that one of my favorite pizza purveyors—Midway's Cafe Galleria—opened up shop in Murray (6055 S. 900 East, Salt Lake City, 801-266-2225, CafeGalleriaPizza.com) this year. One of the things that sets Galleria pizza apart is the high quality and flavor of the cheeses used. The owner of Cafe Galleria, Cecil Duvall, is an artisan cheesemaker, and his Duvall Farms cheeses top his fabulous pies; he makes it all, from goat cheese and ricotta to mozzarella and Parmesan. The mozzarella-Parmesan mix used on most of the Galleria pizzas is perfect.Bonus: The wood-fired bagels are also superb. Before we leave the topic of pizza, I'd be remiss if I didn't mention that in 2014, I finally discovered what many have known for decades: that Tony's Pizza in Ogden (403 39th St., 801-393-1985) has been serving up some of the best traditional deck-oven-style pizza since the 1960s. When all the pizza-dough dust cleared, however, my favorite pizza of the past year was the (literally) from-scratch pizza found at, not surprisingly, From Scratch (62 E. Gallivan Ave., Salt Lake City, 801-538-5090, FromScratchSLC.com). It definitely doesn't hurt that From Scratch mills its own flour for bread and pizzas right on the spot. When it comes to using your noodle, Chef Toshio Sekikawa certainly used his when he opened his namesake ramen eatery, Tosh's Ramen (1465 S. State, Salt Lake City, 801-466-7000, ToshsRamen.com). The place has been standing-room-only packed since the day it opened. And rightly so, because Tosh serves up the rockingest ramen in town. Beautiful broth made from scratch, perfect ramen noodles, nearly see-through slices of pork belly, soft-cooked eggs, and just the right amount of spices and seasonings make Tosh's ramen the best I encountered in 2014. The best chocolate I encountered during the past year was introduced to me by Matt Caputo, of Tony Caputo's Market & Deli. Matt turned me on to Solstice Chocolate (SolsticeChocolate.com), which is produced right here in Salt Lake City by Scott and DeAnn Querry. Their Madagascar 70 percent Sambirano American Artisan Chocolate in particular approaches chocolate nirvana. There are citrus and berry notes and a vivid spicy finish. It's the sort of chocolate you're supposed to savor, a little at a time, but I managed to destroy an entire 2.3-ounce bar in one sitting. According to Caputo, the renowned Chocolatier Blue has selected Solstice Madagascar for 100 percent of their chocolate needs, including their remarkable truffles. That's quite an endorsement! My favorite cocktail from the past year was La Hierba Verde, created by bar manager Scott Gardner at Finca (327 W. 200 South, Salt Lake City, 801-487-0699, FincaSLC.com). The name translates as "the green herb," and it's a scrumptious concoction of Absolut Vodka, white wine, fresh lemon juice, basil, parsley and Bittermens Orchard Street Celery Shrub, served in a cocktail glass. The most useful cookbook to land in my kitchen during 2014 was Cook's Illustrated Meat Book ($40). It's the culmination of more than 20 years of experimenting with recipes and techniques for cooking beef, pork, lamb, veal, chicken and turkey in theCook's Illustratedtest kitchens, and immensely valuable to every cook, from rookies to seasoned chefs. Another excellent cookbook published in 2014 is also one with the longest subtitle: It's called Ikaria: Lessons on Food, Life, and Longevity From the Greek Island Where People Forget to Die ($35) by Diane Kochilas. The author is an expert on Greek cuisine and cooking, and although the people of Ikaria may forget to die, the recipes here are to die for. Finally, my choice for my favorite restaurant of 2014 goes to what some might consider an unlikely candidate: Frida Bistro (545 W. 700 South, Salt Lake City, 801-983-6692, FridaBistro.com). I say "unlikely" because the restaurant isn't new, and might not have the buzz surrounding it that newer kids on the block do. But I think that Jorge Fierro's eatery, serving elevated south-of-the-border fare, is as solid as it comes. And I can't overlook Fierro's contributions to our community. Having started out in Utah as a self-confessed illegal alien who sold pinto beans before creating Rico Brand—which sells and caters some 125 food products such as tamales, salsas and burritos—Fierro is also the cornerstone of Salt Lake City's Burrito Project, which is based out of his Rico Brand kitchens. Together with a team of generous volunteers, Fierro has made and distributed thousands of rice & bean burritos to the homeless people of Salt Lake City. Kudos to Fierro, Frida Bistro and Rico Brand for keeping it real in 2014 and beyond.